The program we use blocked 34 out of 35 exploits tested, while the next highest score was 22 out of 35. Attackers rely on these exploits to penetrate a system. And despite being extremely popular for attackers, many defenses remain vulnerable to exploits, since the software often being exploited – Microsoft Office, Adobe Reader, and the like – is generally considered “safe” by security products. 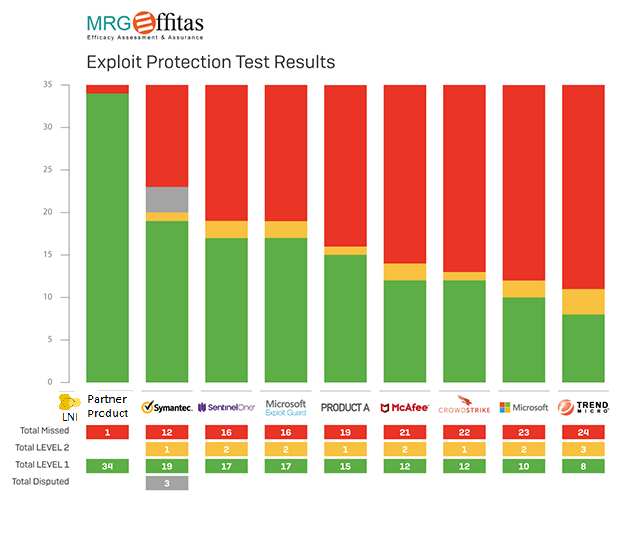 As you can see in the chart below, the program far outperformed other vendors at stopping exploits: Level 1 means that the product blocked the exploit, and Level 2 means that the exploit was missed but the attack was stopped via other methods. Everything in RED was missed completely. It blocked 34 out of 35 exploits tested, while the next highest score was 22 out of 35. In fact, most vendors weren’t even able to stop half of the exploits that it was able to stop. VPN Information »« NEW WEBSITE LAUNCHED!